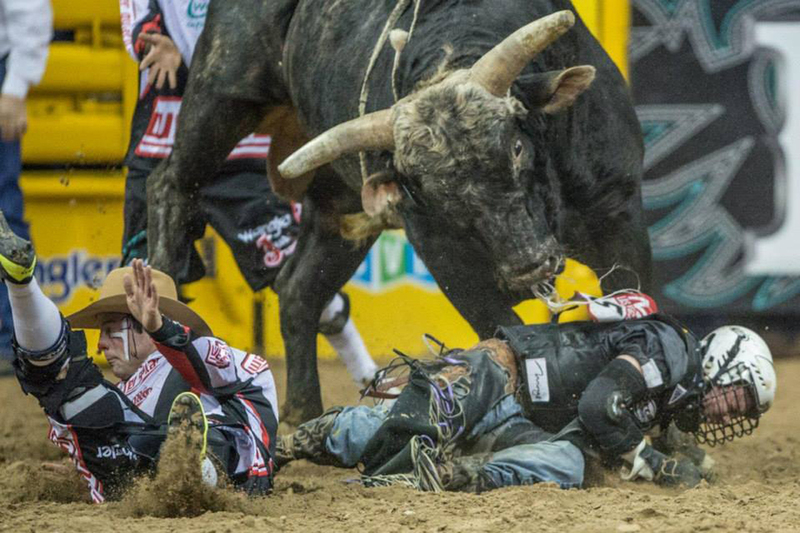 Think you’re tough enough to be a bull rider? Neither do we. Photo courtesy of NFR. Yeeehawww! the rodeo has come to town. Calling all steer wrestlers, bull riders, barrel racers or wannabees, you aren’t going to want to miss the toughest cowboy competition this side of the Mississippi. Vegas is rolling out the red carpet and going country with a host of rodeo competitions for the NFR at the Thomas & Mack Center, country music concerts to rival the Grand Ole Opry, and a whole slew of after parties. Even if you’re a city slicker and the only thing you’ve ever successfully roped is a bath robe, you’ll be in awe of America’s real cowboys. Afterwards, you may get so liquored up you decide to take on a few of the many mechanical bulls we have in town. Go ahead, we won’t judge. See a complete list of NFR festivities. 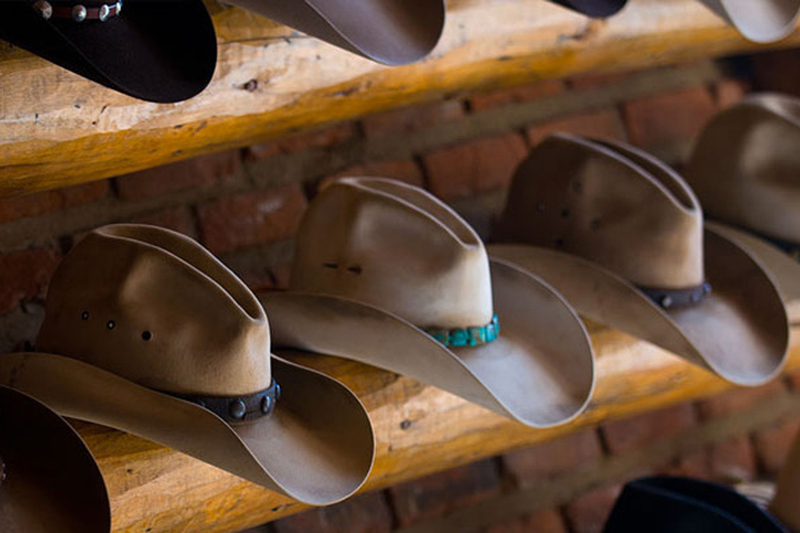 Cowboy hats, belt buckles and boots, everything you need to make your country Western dreams come true. Photo courtesy of Vegas.com. You’ve had your eye on those ostrich skin Lucchese boots for how long? ‘Tis the season for giving, and your hopes of spoiling yourself “someday” have finally come true with more than five colossal shopping expos to choose from. The Cowboy Christmas Gift Show at the Las Vegas Convention Center, the Roper Cowboy Marketplace at Mandalay Bay Convention Center, Stetson Country Christmas Western Gift Expo at the Sands Expo, 2015 Tuff Fest Shopping Experience at the Hard Rock Hotel, and the Boot Barn Christmas Corral at MGM Grand will feature hundreds of the most popular rodeo brands and apparel. If you’ve been searching for that special gift for the cowboys and cowgirls in your life, look no further than Vegas this weekend. See a complete list of NFR shopping experiences. Sing your heart out and laugh until you cry with this entertainment line up. Photo courtesy of Vegas.com. If you believe that country music is God’s music, you’ll feel like you’ve died and gone to heaven for the next two weeks. Huge names in the industry will be serenading us with their velvety voices and southern twangs, like country music mega stars Reba McEntire with Brooks & Dunn, Trace Adkins, Big & Rich, Gary Allen, Tanya Tucker, Josh Turner, Merle Haggard and so many more. May the rednecks rejoice, because we’ve got a hilarious round up of country comedians that will take the stage this week too. One of the top 10 highest grossing touring comedians, Rodney Carrington is at MGM Grand, “Here’s Your Sign” funny man Bill Engvall is at Treasure Island, and Ron White will bring a little more blue-collar comedy to the Mirage. See a complete list of NFR entertainment. Kicking off the Festival of Lights in Downtown Las Vegas. Photo courtesy of Fremont Street Experience. 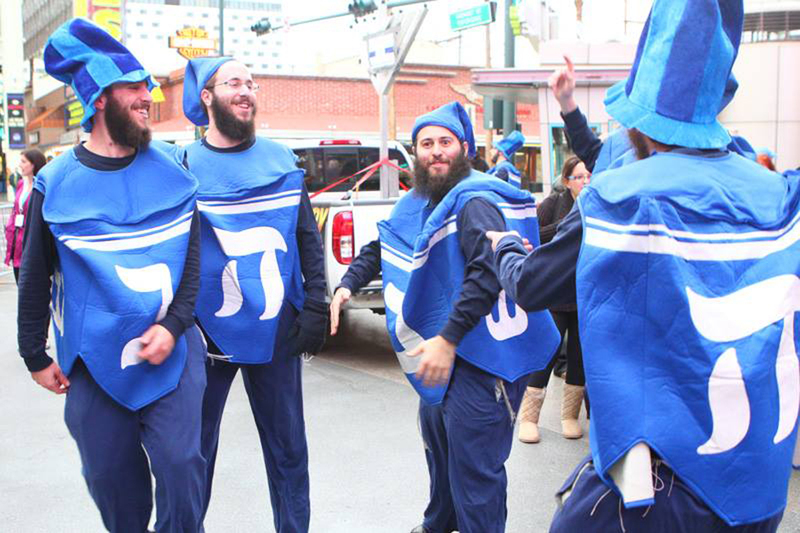 Oh dreidel, dreidel, dreidel, OK that may be the only line we can clearly remember. Hanukkah starts on Sunday, December 6 and at 4 p.m., the 20-foot-tall Grand Menorah will be lit at the Fremont Street Experience. Members of Chabad of Southern Nevada will be there to help kick off the Festival of Lights, and the Menorah will stay up throughout the holiday season. But you can’t forget the food. La Cave at Wynn is celebrating Hanukkah with a special holiday menu of crispy duck breast, sweet potato latkes and purple potatoes for $19. The MGM Grand’s Executive Chef Billy DeMarco has created a special Hanukkah menu at CRUSH that will include pepper-crusted short ribs with apple chutney and crispy polenta pancakes for $19. Both restaurants are complementing their menus with festive holiday cocktails like Eight Crazy Nights made with Blue Curacao, Liquor 43, crème de menthe and egg whites and a Candy Cane cocktail made with Rumple Minze, crème de cacao and half-and-half and garnished with a peppermint candy rim. Yes please, we’ll take two. 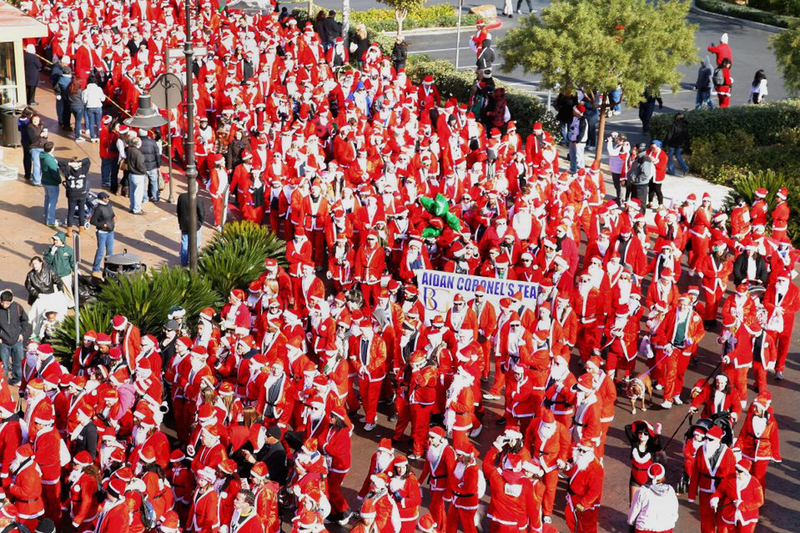 Help us set the Guinness Book of World Records this year at the Las Vegas Great Santa Run. Photo courtesy of Opportunity Village. Can’t find your friends? Don’t sweat it, neither can anybody else. The Las Vegas Great Santa Run is the holiday version of “Where’s Waldo?” with thousands of Santas showing up each year to participate. The 5K run raises funds annually for Opportunity Village, a super cool Las Vegas charity that provides support for more than 2,000 locals with disabilities. In honor of the event’s 11th year, the cast of “Jersey Boys” are the grand marshals and they’ll be supported by a whole gang of local Las Vegas celebrities like Wayne Newton, the Chippendales and the Jabbawockeez. Registration starts in downtown Vegas at 9 a.m. on Saturday, Dec. 5 with the run starting at 10 a.m. Fees are $45 for adults, $30 for kids 12 and younger, and for $10 more, your pampered pooch can run alongside you. Don’t think you can run a 5K? No problem. Sign up for the Kris Kringle Jingle one-mile walk. See more must do events in Las Vegas.